Located in Aywaille, Hostellerie La Villa Des Roses is within a 10-minute drive of Les Grottes de Remouchamps and Les Grottes de Remouchamps. 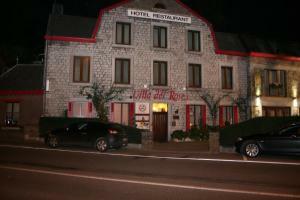 This hotel is 5.5 mi (8.8 km) from Le Ninglinspo and 7.1 mi (11.4 km) from Forestia. Make yourself at home in one of the 9 guestrooms. Complimentary wireless Internet access is available to keep you connected. Bathrooms have complimentary toiletries and hair dryers. Conveniences include phones, as well as desks and complimentary newspapers. Take in the views from a terrace and a garden and make use of amenities such as complimentary wireless Internet access. This hotel also features concierge services, ski storage, and a television in a common area. Guests can catch a ride to nearby destinations on the area shuttle (surcharge). Enjoy Belgian cuisine at Villa des Roses, a restaurant which features a bar and a garden view. You can also stay in and take advantage of the room service (during limited hours). Buffet breakfasts are available daily from 7 AM to 10 AM for a fee. Featured amenities include a business center, express check-in, and express check-out. Planning an event in Aywaille? This hotel has facilities measuring 0 square feet (0 square meters), including a meeting room. A roundtrip airport shuttle is provided for a surcharge (available 24 hours), and free self parking is available onsite. When would you like to stay at Hostellerie La Villa Des Roses ? There is no after-hours reception at this property. Guests arriving late won't be able to check in until the next morning. To make arrangements for check-in please contact the property at least 24 hours before arrival using the information on the booking confirmation. 24-hour airport shuttle service is available. Fees may apply. Contact the property in advance to make arrangements. Each day we'll check prices and send you an email for your selected dates at Hostellerie La Villa Des Roses. If you don't have specific dates but would like to check prices for say next weekend or say next month we can check the price too. Click to write a review and share your experience of Hostellerie La Villa Des Roses with other travellers.